Posted on 05 January 2010 by Steve Thoms. With the International Year of Astronomy just coming to a close, I came to learn a great deal about how the general public views astronomy. Regardless of age, income, religion, politics, or lifestyle, it seems that everyone gets inspired and awed when they look through a telescope. I’ve been amateur-astronoming (yes, it’s a word, and don’t bother looking it up) for around a year and a half now, and even when I see objects I’m very familiar with, it never fails to send shivers down my spine with amazement. While I’m fortunate enough to have a decent telescope and camera, it doesn’t take nearly the investment of money, time, or space (get it?) that you might think. You needn’t drop $500 on a scope that you then need to find a place to store and learn how to use, when simply glancing upwards will show you much more than you might at first think. 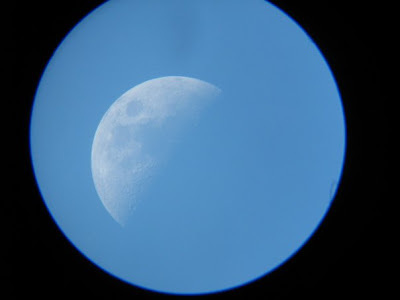 This post is aimed at helping the non-amateur astronomer get into this wonderful, instantly rewarding hobby. It’s a lot easier than it appears! 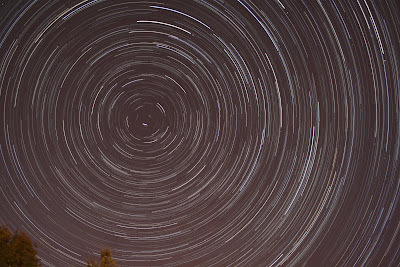 When people think of amateur astronomy, rarely does “naked-eye observation” come to mind. But in a reasonably dark sky, the naked eye can see approx. 10,000 stars! Even in a heavily light-polluted area (when I visited New York City last year, I made sure to take notes as to what I could see in the night sky in the largest city in the United States), a person can still see around 1,000 stars and all the major constellations. The naked eye can also see several open clusters and galaxies, and after a few months of observing, a person can track and predict the path of planets across the sky and constellations. The constellations are perhaps the single best way that a person can learn the map of the sky. 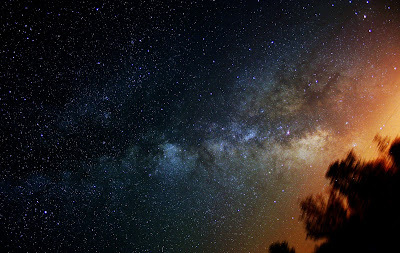 Constellations tend to act as signposts to notable stars and formations (such as the Ursa Major pointing to Polaris, Orion pointing to Sirius, or Cassiopeia pointing to the Andromeda Galaxy). Two great ways to learn your constellations are with software, and with magazines. For software, I recommend the wonderful free-software, Stellarium, which turns your computer into your own personal interactive, zoom-able and customizable-to-your-area planetarium, and will tell you the precise position of the planets relative to the stars, the apparent brightness of all the objects in the database, and it does all this real time. I use this program daily and it’s a valuable tool when I’m looking for a particular object. As for magazines, there are a number of astronomy magazines out there with detailed star charts, such as Sky & Telescope, or the Canadian publication, Sky News, which caters its news and charts to Canadian latitudes. I don’t always like to drag my telescope outside, but I like that I don’t always need to. A night of looking up still fills me with the same sense of wonder that it did when I was a kid, and it’s also better for seeing meteors anyway. The Milky Way. Although I used a several-minute exposure to take this, the naked eye can see definite and clear cloud structure of the Milky Way in a dark-sky area. If the naked eye can see 10,000 stars, then binoculars can allow you to see 100,000 or more! With a decent (and inexpensive) pair of binoculars, a person can see much greater detail in clusters, and with a (really) steady pair of hands, you can even see some different coloured stars of binaries, and the Galilean moons of Jupiter. When you hold your binoculars, get a stand if you can, or prop your elbows against something. If a stand or a prop is unavailable, rest your thumbs on your cheeks and hold your breath while you view. Another important thing to remember is that it’s unwise to view the full moon through a pair of binoculars: you won’t damage your eyes, but it will be uncomfortable and it will temporarily ruin your night vision, and you will have to wait a minute or so for your eyes to reset before you can continue viewing. Binoculars are also useful for spotting things in the sky that are hard to see with the naked eye, which you can then focus a telescope on. This is the single greatest tool of the amateur astronomer, and most people who are interesting in getting one, end up being too intimidated by the myriad of prices and choices: Reflector, refractor or Schmidt-Cassegrain? Dobsonian or Tripod mount? Go-to, push-to, or manual? Does it track? Size: Even if the scope has the power capabilities, if you have a really big/bulky scope, you’re less likely to take it out, especially if you have to climb up or down stairs. Smaller scopes, while versatile, generally can’t see too much, unless you get a Schmidt-Cassegrain (which tend to be far too expensive for the beginner). Complexity: If you have a great deal of gear that is designed to be easy to use, if you don’t know the basics of telescope functions, or if it breaks down, or you can’t find a power supply, you will just have an expensive tube with some wires. Scale up to computerized scopes only when you’re ready, don’t jump the gun. Price: Scopes cost a great deal less than they used to. Construction methods are improving, and the savings are being passed onto the consumer. You can get a great starter/student scope for around $300, and it will be a scope that 15 years ago would have cost $1000. Also, don’t get one of those cheap scopes from a department store. They are terrible, and you will be frustrated: You’ll think that you are doing something wrong, but I promise, it’s not you, it’s the terribly cheap scope that you paid $39.99 for. Mount: Dobsonian mounts are VERY stable and can support a great deal of weight, but they are also bulky and heavy. Tripod mounts are not nearly as stable, and they cannot support as much weight (you may want to add some things onto your scope and a tripod may not be strong enough), but they are versatile, collapsible, and can function on uneven surfaces. Choose carefully, but don’t torture yourself with uncertainty. Sometimes you just have to pull the trigger and decide. If you do end up making the wrong decision, you won’t realize it until much further on down the road anyway, and you will still get many hours of enjoyment. A camera is not for everyone, but speaking from experience, about half of my astronomy journey has been behind the camera. I’ve taken countless shots and when viewing them on my computer later, I had “discovered” countless nebulae, galaxies, and clusters that I didn’t know I was looking at through a scope. This is because a camera’s light receptors can stay open and receive a great deal more photons than the human eye and brain can process. Cameras can capture incredibly faint objects….things that your eye simply can’t. 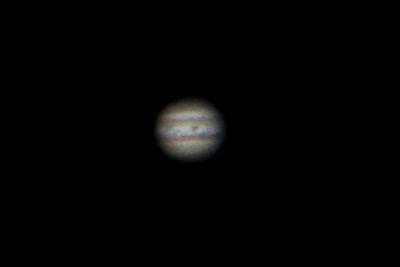 This was the first astro-photo I ever took, using the super-advanced technique of holding my camera to the eyepiece of an old refractor on a rickety tripod. However, because a tracking device is not for the beginner, but for the intermediate, make sure you only buy one of these when you think you’ve reached the limits of your technology….only scale up when you’re ready! If there is one in / around your area, join an amateur astronomy club. I did when I was starting out, and I’m very glad I did. The other members helped me out when my rickety scope was breaking down, and they made great suggestions with how to get the most out of my gear. Amateur astronomers are some of the nicest people you will ever meet, and they’re always willing to share their passion with you with all the patience and enthusiasm that a beginner has. 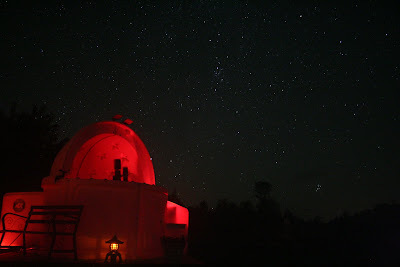 Though it is the most ancient profession, ironically, astronomy never gets old for anyone. 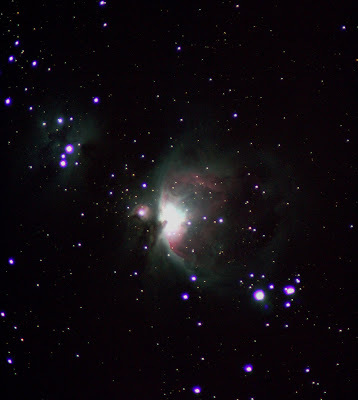 For a list of amateur astronomy clubs in Canada, click here. Don’t be shy: contact them, and they’ll be happy to have you as a member. Even if you don’t own a scope, you can still learn a lot, and make some new like-minded friends. I promise you it’s worth it. If you can’t find a local group, the folks over at Sirius Stargazing have a helpful youtube channel. If you’re interested in buying something more substantive than some magazines, I recommend perhaps the greatest book for amateur astronomers in existence, NightWatch, by Canadian Terrence Dickenson (whom I’m name-dropping). When I go out stargazing, I like to listen to the wonderful Astronomy Cast on my iPod, hosted by the silky-voiced Pamela Gay and Canadian Fraser Cain. These two do a wonderful job at explaining complicated astronomy principles for the non-expert, and it’s one of my favourite podcasts out there. I hope this entry helps at least one person get into amateur astronomy. It’s been my wonderful pleasure to show my telescope to young children and grandparents alike. It’s easy to get jaded in this information-saturated world these days, but I feel certain that even the most cynical individual can reluctantly look through a telescope for the first time, and see a mountain-range on the moon, the bands of Jupiter, the rings of Saturn, or the clouds of Orion, and *gasp* in the exact same way that I do every single time….it never gets old to me. Astronomy is a different kind of hobby than most. I’ve been a musician my whole life, (click here to hear me rock!) but it takes a great deal of perseverance and practice to get a sense of accomplishment and satisfaction. But all I need to do is move my telescope (or “slew”) to a seemingly random spot in the sky and I instantly feel gratification, inspiration, and awe. I’m confident you will too. Now get out there, and keep watching the skis! 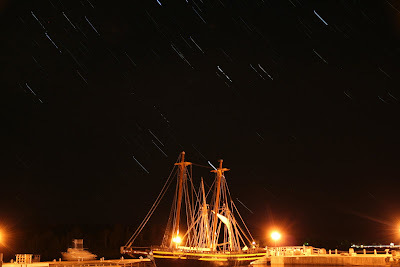 For some of my astro-photography samples, click here. For some of my astronomy articles, click here.